Summary: High in a snowy mountain range, a monastery that holds more than just faith clings to the side of a cliff. Below, thwarted by a lake, a bloodthirsty horde of raiders await the coming of winter and the frozen path to destroy the sanctuary and its secrets. The Witchlands series is probably one of my favourite on-going series'. I've been impatiently waiting for the release of book three, and the fact that it's Aeduan's story had me even more excited. As with the previous books, Bloodwitch, switches perspectives, with Aeduan's being the central point of view. I have shipped Aeduan and Iseult since the first time they crossed paths in Truthwitch. So, it's no surprise then that my favourite parts of Bloodwitch where when they were together - like I tried to slow down and savour those moments when I got to them, yet at the same time I couldn't read fast enough. Dennard has done such a good job with creating tension between these two - they are the definition of slow burn. If you're looking for a YA fantasy which features complex and multi-layered female characters this is the one. I love how Dennard has created female characters that are strong, but in different ways. She shows that the term "strong female character" doesn't just mean being able to fight and not liking feminine things - which I really appreciated as this is something that frustrates me. A character who I absolutely fell in love with in Bloodwitch was Leopold. I really enjoyed his interactions with Iseult, but he's still a bit of a mystery, so I'm hoping we get to learn more about him in the next book. The overall plot was amazing, and I liked all the interconnecting story-lines. 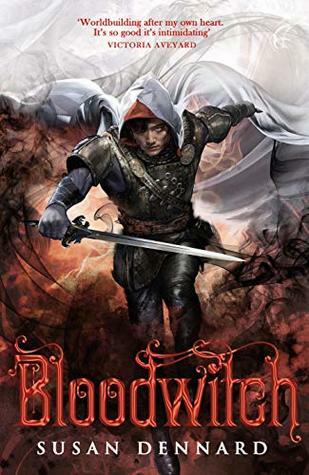 All in all, Bloodwitch was a fantastic addition to the Witchlands series! Yay :D Great review Renu. <3 So glad you enjoyed this book :) I have not read book one yet, ahh. But I do own them all, so I will, one day :D Glad this one was awesome.